Running has become a part of my daily routine ever since I took part in a 5K “Fun Run” early in 2012. This was the lead up to the featured “Stawell Gift” which is Australia’s oldest race and takes place every Easter weekend in Stawell, a small town in the Grampian Mountains district of western Victoria. I won’t go into depth on the farcical idea of a run being “fun.” It’s not. And it never becomes fun. After nearly a year on the beat I have yet to have a “fun” run. Don’t believe me? Take a good look at the next runner you see. His facial expression is somewhere in the spectrum of the passing of a kidney stone, and receiving a proctologic exam. So why do people run? Well, my friends, that is a blog for another time. 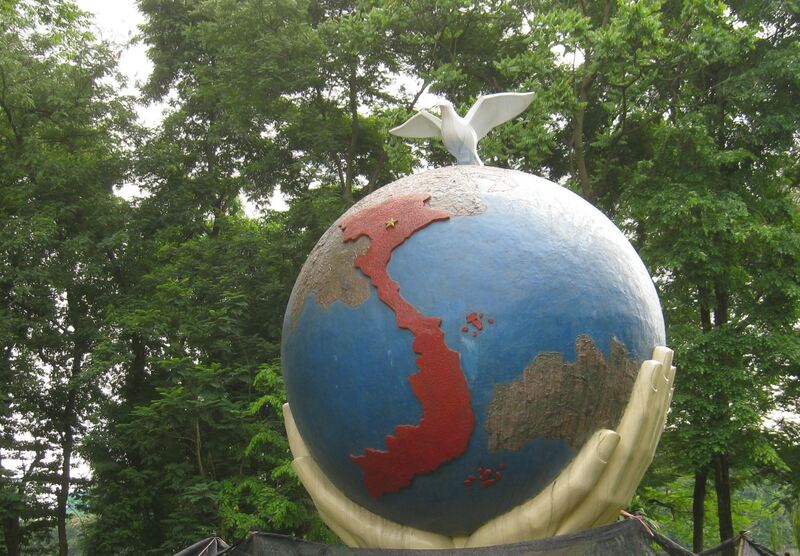 You never realize how big Vietnam is until you see this globe. The day started off like every other in Hanoi, the hot, humid Northern Vietnamese capital where mornings can be spent buying knock-off handbags or shoes, attending a water puppet show or queuing up at the Ho Chi Minh Mausoleum to view “Uncle Ho” and his long wispy beard lying in state. I peel myself out of bed, careful not to disturb Sleeping Beauty, and get ready to get ready for the day. Little did I know that I was about to have a run in with a Golden Turtle God and a cultural experience you don’t see listed in the guide books. 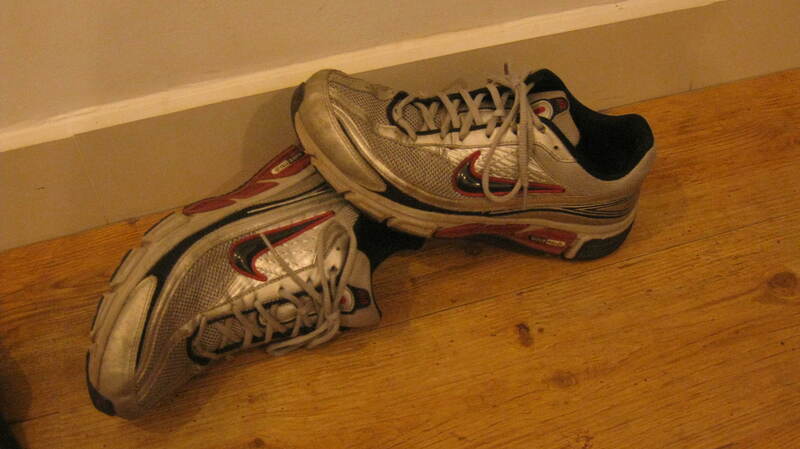 Before I stumble out into the polluted humid haze, I must find clean, or somewhat clean, running gear. This is a bit more involved than it may sound when one is living out of a backpack. Many locations are not ideal for getting the laundry done. So one must improvise. Clothing rotation becomes an art. As does the washing of items in a shower, bath, sink, fetid rain puddle, etc. At least you don’t have to worry about drying items. A few minutes in the morning heat and clothes are bone dry. (Enough on housekeeping.) My required jogging uniform calls for running shorts and when available a shirt that “wicks”. Although the latter may just be a comfort thing as the amount of sweat I produce during a run quickly overwhelms any moisture wicking system. Those magical synthetic fibers don’t stand a chance. At what point do they accept their fate and surrender? Well, the little white flag usually appears with little fanfare about 30 minutes in. Clearly these things weren’t designed for my use. With clothes sorted I hunt for my other mandatory accessory, the MP3 player. Have you ever exercised to the soundtrack of your own ragged breath? It is quite unsettling and should be avoided at any cost. Ever dialed your favorite adult chat line and mistakenly gotten connected to the geriatric heavy breathing line? No, me neither. But I imagine that is exactly what it sounds like. I move thru the lobby making the requisite courteous grunts to the staff acknowledging that it is in fact morning. They give me a knowing smile as they have seen this act before and know full well that I will return as a soaked, still pulsating geyser of perspiration. Kids! Come quick! Giant, white man of many sweats is coming! Even nighttime is a sweaty affair. 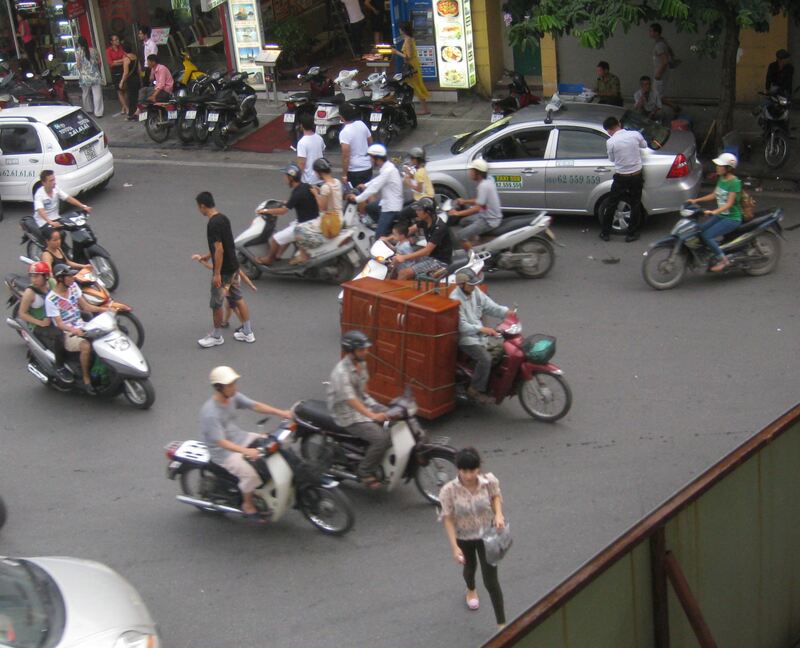 As the North Vietnam capital, Hanoi is teaming with people. Walking down the street can be quite an ordeal if you haven’t gotten acclimated to the ebb and flow of traffic, both motorized and pedestrian. Even if you have mastered the various rules of right of way and are willing to boldly step off of the curb directly into the face of oncoming traffic (this is a required skill if you are to make any progress) you will find no place to run. 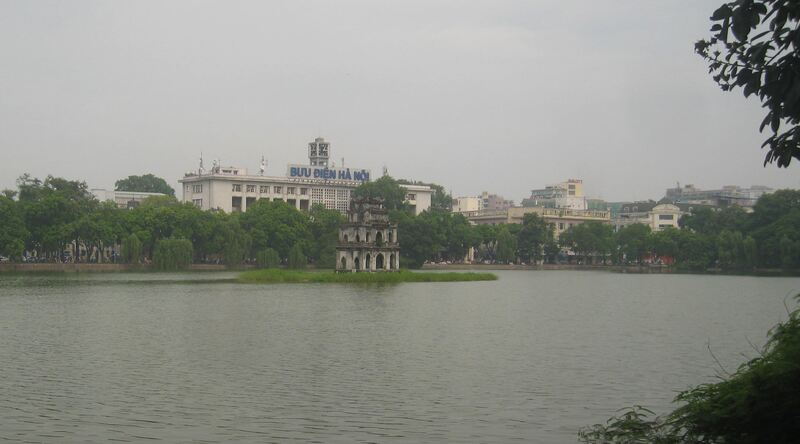 Your only option is Hoan Kiem Lake, the “Lake of the Returned Sword”, the center point of city. It was here in the 14th century that while enjoying an afternoon at his favorite body of water, Emperor Lê Lợi had his magic sword taken by the Golden Turtle God, Kim Qui. This sword was his Excalibur. Stories claim he grew very tall when he used the sword. My sources say as tall as 5’3”! Cute little fairy tale, isn’t it? Come on. I could come up something better than that if I lost my sword. Well, as long as Mrs. Emperor Lợi bought the story, what’s the problem. I guess. Need help moving those cabinets? I will be right over with my moped. Today you won’t find emperors or giant reptiles with a penchant for lifting edged weapons. 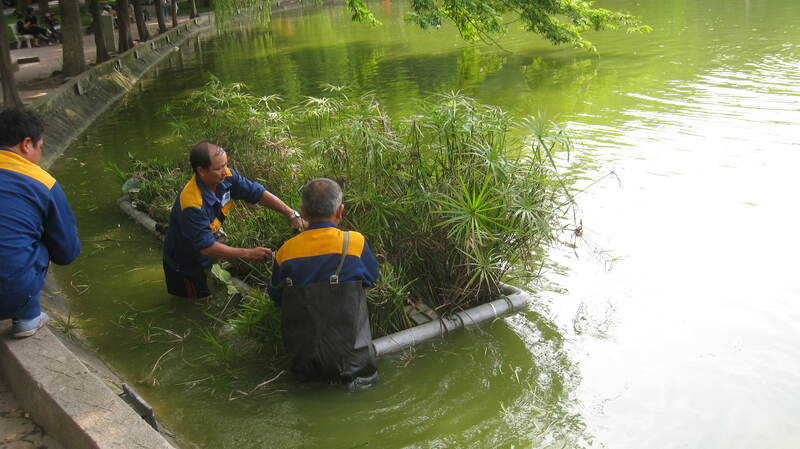 Instead the lake bustles with locals and tourists alike. Locals, young and old, flock to the lake to get in their morning walk, stretching routine, calisthenics or to attend one of the informal Tai Chi sessions. You may even see some engaged in an odd conga like dance routine. This all kicks off at around 5AM and wraps before 7AM. The day starts early in this city. Staring – You will inevitably be stared at. Just stare back and smile. It sounds simple enough. Just stare back and smile. I can do that. 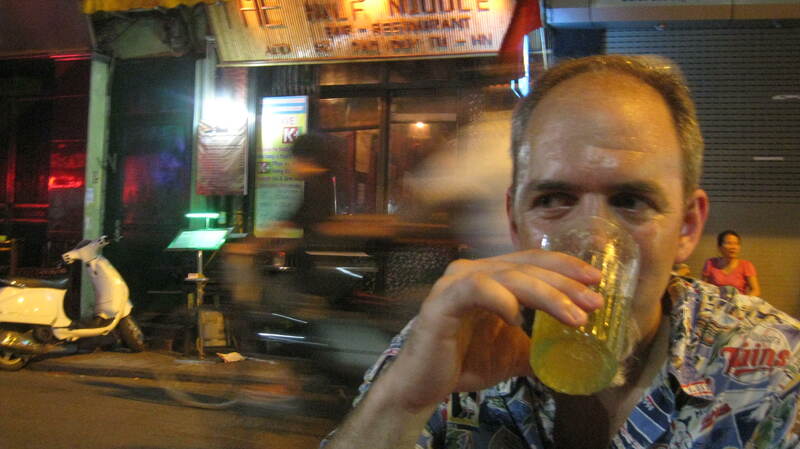 The Vietnamese people are friendly and I have taken to the method. People are simply curious and in their eyes I look very different. Take it in stride, meet their gaze and smile back. This approach is generally met with an acknowledgment and return smile. I’ve got this thing down. The run begins just like any other. I briskly meander my way through the throngs and around the lake. While keeping my proctologic exam look firmly in check, I calmly meet the many stares in full compliance with rule #5. I throw in a head nod at times for good measure to complete the custom. But wait. Are the mental cobwebs of the early hour catching up with me? Or I am I getting more stares than usual? Hmmm. Hard to say but I am definitely noticing a marked increase in the enthusiasm by which my smile is returned by onlookers. Perhaps it is a national holiday and people are caught up in the accompanying glow? Whatever the cause I am definitely sensing a change. No bother. I am resilient. I have a few miles to go. Stick to rule #5 and everything will work out. But hold on. Did I see a snicker? I definitely think I saw a snicker. WHY ARE THEY SNICKERING?! OK. Maybe it isn’t a full on snicker, but they are definitely enjoying themselves more than usual. I did remember to put on clothes. So what is the problem? Hmmm. Come to think of it, my feet do feel a bit more sweaty than usual. Am I bleeding? As I train my gaze downwards I am totally unprepared for the spectacle I am about to witness and one which I have joyfully presented to the viewing public for the last 30 minutes. My socks and shoe tops now resemble a sudsy loufa. A trail of animated scrubbing bubbles is racing down each leg. For the first time in my life I had achieved the perfect storm of sweat, friction and laundry detergent residue. My crotch had become a bubbling cauldron spewing forth lather and soap suds at a prodigious rate! I was no longer a simple oddity. I had become a full fledged lumbering sideshow. The Golden Turtle God has smote me for my lack of faith. He couldn’t take my magic sword so he took my dignity. Good show, old boy! So what is a mobile lather dispenser to do when he finds himself the center of unwanted attention? Why that is simple. Make a mental note to fire my launderer. And then just stare back, smile and do another lap. May my wife be as compassionate as the Empress. That magic sword is in here somewhere. I’m laughing so hard I’m crying. You’re the best Steve-O!